Day 186 : Lions and Tigers and Boys, Oh My! One never knows when one might cross paths with one of the Bigs. But should you travel to the wonderful world of Ford, and find yourself surrounded by beings practically throwing food in your face, keep an eye out for this frozen visage. No amount of oil found in the Motor City will loose this Boy. I don't know if I have the heart to tell him of the fate of his northern brother. It's a twister. "I don't think we're in Kasky anymore." An' keep yer round down. It's time to get outta town." A Big Boy representative made an appearance at the 82nd National Trout Festival Parade in downtown Kalkaska. Despite this show of good faith, the representative was unwilling to face the camera, as well as the music, when approached on the matter of Big Boy's supposed fall from grace. The waiting game continues. In the meantime, I did receive a coupon for a free hot fudge ice cream on my birthday when I join their email list. Snow has returned to symbolize the cleansing of the yard. Alas, our Boy is gone. Patrons are filling seats inside the restaurant to pay their respects, and their bills, while the staff continue serving their classic American food and milkshakes. Sadly, none of those milkshakes will be bringing Big Boy back to the yard. 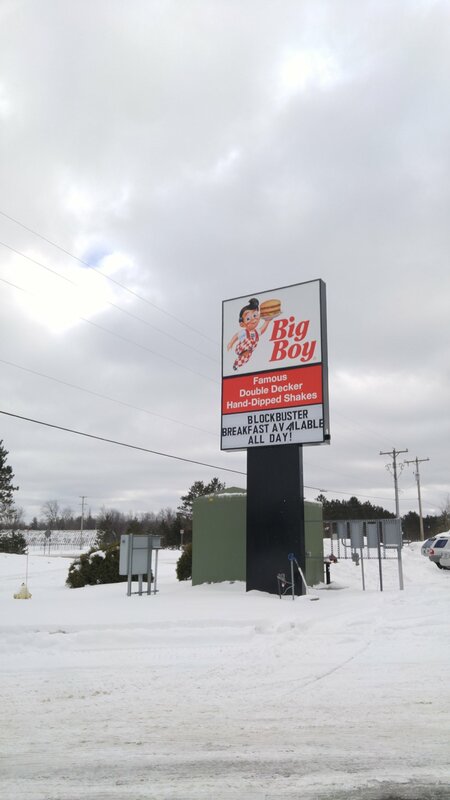 High winds swept through Kalkaska, Michigan, taking down the Biggest Boy in the region. These winds were clocked at just under the current maximum human sprinting speeds, with spurts nearly twice that. Some are speculating that he "should have tried the fish".